Christ's church is Christ's people. "Called out" from other people who are not Christ-like. Jesus loved all men of all races and tasted death for "every man" (Hebrews 2:9). His death was God's means of overcoming the broken fellowship between God and man, caused by sin. Because God and Christians have wonderful companionship when sins are forgiven in Christ, this fellowship provides the way for all races and segments of society to be one with each other. All colors, economic levels, and social distinctions become "one in Christ Jesus" (Galatians 3:28). Christ's church shows Christ's oneness to all men. God's plan to forgive all men in Christ required selection of a special race, the Jews, the descendents of Abraham, to bring Christ into the world. These Jews missed the point of their special privilege and became proud racists in their vain superiority over other nations (the Gentiles). But godliness (God-like-ness) opposes national or personal self-elevation, because "God is no respecter of persons" (Acts 10:34). No racial prejudice ever surpassed Jewish hatred for Gentiles. But Ephesians 2:14 shows that Jesus "is our peace, who made both one, and broke down the middle wall of partition." Verse 15 says that he abolished in his flesh the hatred, that he might create of Jew and Gentile "one new man, so making peace." Verse 16 explains how Jew and Gentile were both reconciled to God and to one another by the cross and in one body, the church. 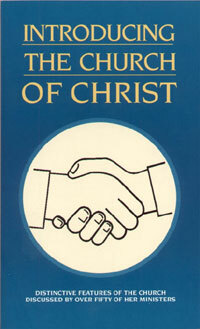 The church of Jesus Christ, therefore, is God's eternal plan for human and divine togetherness for all men. The universal leveling produced by a common salvation in Jesus' death results in a universal fellowship of Christ-like love and concern. Early Christians "had all things common" (Acts 4:32) and functioned unselfishly for the good of each other as do parts of a human body (Romans 12:5). Today's world is full of hatred between races, castes, religions, colors, economic levels, and proud individuals. All hatred comes from our separation from God, but love comes from God. "He that loveth not knoweth not God, for God is love" (1 John 4:8). God's love is the only source of genuine fellowship to heal our world's bigotry and hatred. The good news (gospel) message that God so loves the whole sinful world that he gave his only-begotten Son to die for it (John 3:16) is the only basis for peace among men. No legislation by law-makers nor sincere efforts by social peacemakers can solve the real problem -- man's sin and necessary separation from God's holiness. God is holy and pure. He cannot stand sin. His presence before Moses made ordinary dirt "holy ground" (Exodus 3:5). His name is holy and reverend (Psalm 111:9). Angels sing, "Thou alone art holy" (Revelation 15:4). Man must be holy because God is holy (1 Peter 1:16). Without holiness no man can have fellowship with God (Hebrews 12:14). But man is not holy by nature, he is sinful. He is basically un-God-like, or ungodly. The thoughts of man's heart are only evil continually (Genesis 6:5). There is not a just man on the earth that doeth good and sinneth not (Ecclesiastes 7:20). There is none righteous, no not one (Romans 3:10). All men have sinned and come short of the glory of God (Romans 3:23). Man is fleshly, sold under sin (Romans 7:14). In his flesh dwells no good thing (Romans 7:18). Because God's nature is angered by sin, He must punish every sin. He has eyes too pure to look upon sin (Habbakuk 1:13). Evil is an abomination to God (Proverbs 15:8). His wrath is revealed against all ungodliness and unrighteousness (Romans 1:18). Every sin must receive a proper punishment (Hebrews 2:2). If God failed to punish a single sin, he would be imperfect in justice. He would be like an unfair judge, partial and corrupt. But because he is perfectly just, God must punish every sin. This shows why Jesus had to die for sinners. The very nature of God cannot stand sin. But the very nature of man is to practice sin. Because God is perfectly just, he must punish man's sin. And a perfect standard of right and wrong doesn't remedy man's sin problem. Law only exposes man's guilt and his need to be forgiven of sin. By the basic nature of God and man, the only way man could be forgiven by God was for God to find a way to punish sin and yet to forgive man, the sinner. Jesus' death was the answer. Christ suffered in the place of sinners. Because God must punish sin, man's sins were punished upon Jesus. His death was a substitute sacrifice for us. He has borne our griefs and carried our sorrows. He was stricken, afflicted, and smitten of God. He was wounded for our transgressions. He was bruised for our iniquities. He was chastened so that we could have peace with God. With his stripes we are healed. God has laid upon him the sins of us all. God's demand for sin's punishment was satisfied when he saw the travail of his soul (Isaiah 53:4-12). Christ suffered sin's penalty in man's place. The word "atonement" means "at-one-ment." It is the price paid which enables peace to be restored between enemies. Him who knew no sin, God made to be sin on our be- half that we might be made righteous because of him (2 Corinthians 5:21). Jesus bore our sins in his body on the cross, and by his stripes we are healed (1 Peter 2:24). Christ suffered for sins, the just for the unjust, that he might bring us to God (1 Pet. 3:18). All have sinned and come short of the glory of God, but forgiveness of sins freely justifies or makes man righteous in Christ (Romans 3:23, 24). This is possible because God has given Jesus as a sin-offering that satisfies God's anger against sin. God now can both punish sin and also forgive the sinner who trusts in Jesus (Romans 3:25,26). A man from Ethiopia was riding in his chariot, reading the prophet Isaiah about God's suffering Lamb upon whom man's sins were laid (Acts 8:28). The preacher Philip began at this Scripture and preached unto him Jesus (verse 35). The Ethiopian then wanted to be baptized (verse 36). They stopped the chariot, went down into the water, and the man was baptized (verse 38). He then came up out of the water rejoicing because his sins had been forgiven in the death of Jesus (verse 39). The Ethiopian African had been taught by Philip, a Jew - racism had been erased by the atonement message of Jesus. The death of Jesus erased hatred between God and man and between men and other men. Christians have all things common in Christ's one body, the church. Men of different races and status become new men in Christ, who then proclaim the saving message of the cross to a world of sinners of all races alienated from God and from one another. What causes the separation of fellowship between God and man? What was God's purpose for the Jews, and how did they corrupt this purpose? What body is God's plan for human togetherness? Name two characteristics of God which cause him to separate from man. Explain the meaning of "atonement." What was the Ethiopian reading, what did he hear preached, what did he do, and why did he rejoice? Why would Philip, a Jew associate with an Ethiopian? What message will saved sinners give their lives to proclaim?